Further progress continues on all fronts both home and away. In addition to the seemingly never ending axlebox machining, work also proceeds on machining the keeps, spring hangers and spring links. The brake hanger brackets have been riveted to the chassis, however the pair for the leading wheelset will be attached with fitted bolts. 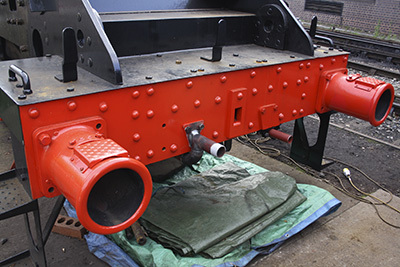 Steady progress is being made in fitting vacuum and train heating pipework around the underneath of the smokebox saddle area. We expect news daily about our wheels and cylinders and hope we will soon have all these major items at Bridgnorth and we may then commence fitting them to the chassis. We recently commissioned an exclusive 82045 tie. 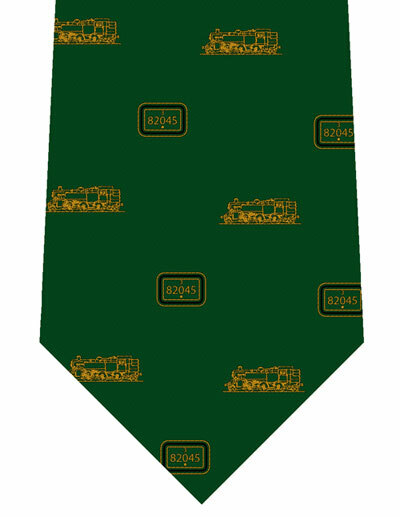 Made by William Turner of Stockport, the all polyester tie features an outline drawing in gold thread and our 82045 logo in an all over design. The ties are available from Barbara at £12.75 (inc.p+p). Chris had a meeting with Stockport-based artist Stephen Millership at the beginning of the month (see September update), following which we commissioned him to produce a poster announcing the arrival of 82045 into the world of heritage railways. He is already hard at work, and the poster will without doubt raise our profile still more on the SVR (and elsewhere). Have a look at Stephen’s website and at the quality of his work, and I’m sure you will agree that we will have a marketing asset we can be really proud of. Thanks, Stephen, for your enthusiastic response and for the very reasonable fee you are charging us. Last month, I asked for suggestions for a text to appear on the poster. Many thanks to all of you who responded: there were some great suggestions, and I apologise if I omitted to reply to anyone. After a deal of thought, I have decided on Raising the Standard, sent in by Iain Jack. This is short and snappy, and expresses in three succinct words pretty well everything the 82045 project stands for. Well done, Iain - it is so much better than the one I came up with! There will be a subtext along the lines of Coming soon - a brand-new steam loco for the Severn Valley Railway. As you know, we are reluctant to reveal too much information about our finances in a public forum. However, I can tell you that the tentative target - £100,000 by the year end - set at the time the Boiler Appeal was launched in March, had been well exceeded by the middle of October. We are on target to reach the critical half-way mark of £150,000 by mid-2015, so look out for an announcement, in the not-too-distant future, that work on the boiler is under way. This is entirely owing to the generosity of our supporters: you are, each of you, a part of a really significant piece of railway history in the making. None of us pretends that 82045 can compare in glamour with some other new-build locos, and it is pleasing that so many people appreciate the more subtle implications that this project has for the future of standard gauge steam on the preserved lines of our country. If you can look that far ahead, and across the looming winter, please note that the 2015 AGM is to be held on Saturday 11th April at 14.00 at Kidderminster Railway Museum (upstairs Lecture Hall). All are, as ever, welcome. Our colleagues Bryan Clarke and John Gupwell are organising a special train to raise funds for the boiler. The special will run on a March/April date still to be finalised with the SVR, and will consist of three coaches hauled by Collett 0-4-2 tank 1450, a member of the class that starred in the 1952 Ealing comedy The Titfield Thunderbolt. Planning is still at an early stage, but we have the enthusiastic support of the Railway. What makes this special really “special" is the fact that its focal point is to be the little-used Eardington station. The plan is to run from Bridgnorth to Hampton Loade, then back to Eardington, where we will stop in section (it will be a non-running day) for a leisurely break and a variety of nice jollies before making our way back to Bridgnorth. Steve Downs, Station Master at Eardington, is delighted with the idea: wait till you see the lovely job he and his gang have made of this often-overlooked gem of a station. Tickets are £19-65 (the idea of rescuing the Severn Valley line from oblivion was first mooted in 1965!) and all profits will go to the boiler fund. 1450 will carry an appropriate name board on the day, and we would love to hear your ideas for a suitable name for the train. The successful entry will win a modest prize, so please let Chris have your suggestions. Watch this space for more details - including a chance to ride on the footplate of 1450 - over the next couple of months. The front buffer beam with vacuum and train heating pipes in an unfinished state. Photo: Tony Massau. 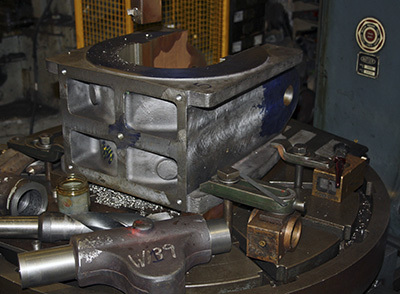 Machining in progress on one of the cylinder castings at Tees Components. 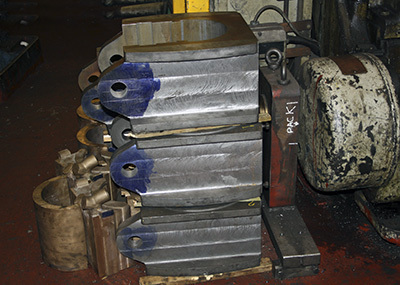 Photo: Tees Components Ltd.
An axlebox on the slotting machine with a spring hanger on the table in the foreground. Photo: Tony Massau. 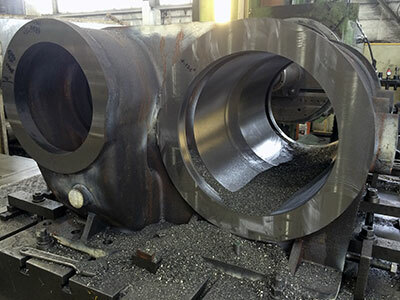 A stack of machined axleboxes and keeps. Photo: Tony Massau. The New 82045 Neck Tie.